Serbian police officer attempt to organise migrants queuing to get registered at a refugee center in the southern Serbian town of Presevo, Monday, Nov. 16, 2015. The focus on a Syrian passport found near the body of a suicide bomber in the Paris attacks highlights an uncomfortable reality: European authorities are completing few checks on the hundreds of thousands of people moving across their territory fleeing war and poverty. Paris prosecutor's office said on Monday that the man who blew himself up outside the national soccer stadium was found with a Syrian passport with the name Ahmad Al Mohammad, a 25-year-old born in Idlib. It said fingerprints from the attacker match those of someone who passed through Greece in October. Besides Greece, the passport was registered in October in Serbia and Croatia, all three countries on the corridor that crosses the Balkans and is known for lax controls and ease in obtaining transit documents. The owner was allowed to proceed because he passed what is essentially the only test in place - he had no international arrest warrant against him, police in the states said. It was not clear whether the passport was real or fake, but trafficking in fake Syrian passports has increased as hundreds of thousands of people try to get refugee status, the chief of the European Union border agency Frontex has said. Most of those who enter countries on the so-called Balkan corridor for migrants - Greece, Macedonia, Serbia and Croatia - are registered with authorities. Their data are checked against Interpol records, and their fingerprints and photos are taken. But, many people tell officials that they've lost their identity papers, and they can give false names and other information, including their country of origin. A large majority of migrants declare themselves as Syrians from the war-torn country, although they have no documents to prove it, Serbian police say. Syrian refugees have a better chance of getting asylum in Germany than those classified as economic migrants from Afghanistan, Iraq or Pakistan. Migrants walk through a field trying to cross the border with Croatia near the village of Berkasovo, Serbia October 23, 2015. 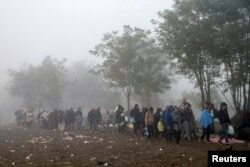 In Serbia, some 490,000 migrants have passed through this year, and many say they don't have documents _ making it impossible to check for terrorist connections or criminal histories, to verify their backgrounds, Serbian officials said Sunday. There are no recorded cases of people being turned away after random checks anywhere in the Balkan migrant corridor. That may be because the corridor states want migrants to pass through quickly, without getting stuck in their territory for a long time before reaching rich EU states such as Germany, Sweden or France. Frontex spokeswoman Ewa Moncure told The Associated Press that "among some 500,000 people, you will find some with false documents." "There is always a certain percentage of false Syrian passports and identity documents revealed on the Greek border," she said. The holder of the passport found next to the bomber's body is registered as entering Greece on Oct. 3, Greek officials said, adding that the passport owner entered the country through Leros, one of the eastern Aegean islands that tens of thousands have been using as a gateway into the European Union. The owner of the passport then formally requested asylum in Serbia Oct. 7, according to a Serbian police statement. The document allowed him three days to pass through the country on his way to Croatia. Police did not give a name, identifying the passport's owner only as A.A. The passport-holder entered Croatia from Serbia on Oct. 8, Croatian police spokeswoman Helena Biocic said Sunday. The owner was not flagged as suspicious and then proceeded to Hungary and Austria. The passport was found after Friday's attack on France's national stadium, next to the body of one of three suicide bombers who blew themselves nearby. In all, 129 people were killed in Paris in the violence, the worst in France in decades. Authorities said three teams of attackers were involved in the gun and bomb attacks on the stadium, a concert hall and Paris cafes.